Click to Register Now !! The 14th Regional Investments & Capital Markets Conference of the Jamaica Stock Exchange (JSE) promises to be the most spectacular, inspiring and content-rich conference yet, as we will be launching our 50th-anniversary celebrations, unroll and launch plans for our Jamaica Social Stock Exchange (JSSE) and put on display, equipment that will bring value to MSME’s and startups. This conference promises to amplify partnership opportunities for regional investors, business and state leaders, along with aspirant investors and entrepreneurs. JSE as at November 2018 was once again named the “The Best Performing Stock Exchange in the World”; our successes and achievements are world-acclaimed! Hence, our Regional Investments & Capital Markets Conference will present the perfect platform for our partners, investors, potential partners, potential investors, and other stakeholders to share in our successes. 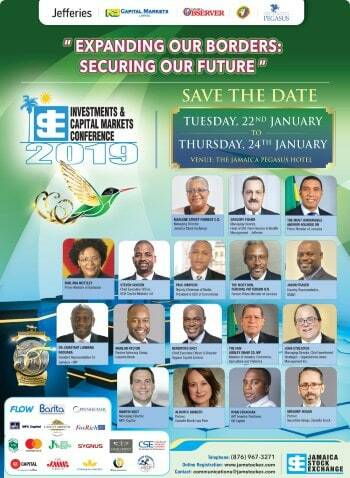 Industry leaders and pioneers, state leaders and investors will discuss and share great opportunities, insights and ideas as we work to remain on top while providing value to our stakeholders and economy. Don’t forget to complete your registration form below. If you plan on sending a delegation from your company to the Conference, kindly download our fillable PDF registration form below. Kindly complete a form for each team member attending the conference.